For many companies, especially REITS, banks and insurance companies, which hold large portfolios of commercial real estate properties, loans, or securities, the direction of commercial real estate markets will have a significant impact. There is significant uncertainty on the direction. 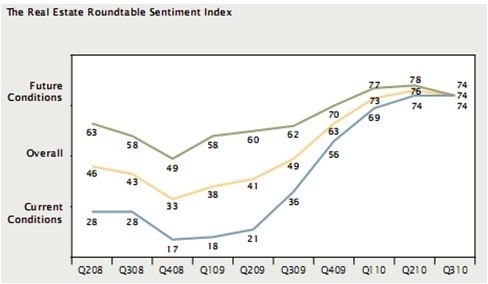 So it is worthwhile to examine the views of market participants. Going back to CMBS spreads, the tightening probably just reflects the sentiment expressed in other surveys of an expectation of slowly stabilizing CRE market. For CMBS, as opposed to properties, a consensus that the property price decline has stopped will be enough for bond spreads to tighten. Real estate prices do not necessarily need to go up for CMBS spreads to tighten. What happens if the sentiment on the economy sours impacting the view on the commercial real estate too? Even in that scenario, more and more people are coming to the view that the senior most CMBS bonds will likely not suffer a principal loss, which makes them attractive given the additional yield they provide compared to other similar investments. So, worsening economic conditions may actually cause people to move up in capital stack, creating demand for senior most bonds, and providing support for spreads. No one knows what future will bring, but logically, odds look in favor of the spreads moving in the direction suggested by the unanimous view. And that will good for those companies that have large holdings of commercial real estate securities. 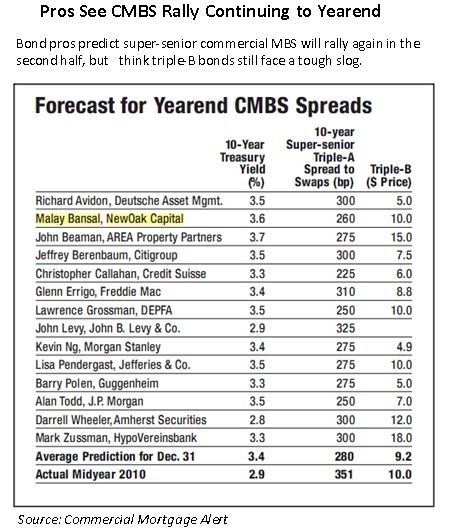 Note: The views in this article and my spread predictions in the Commercial Mortgage Alert article referenced are solely my own.